What is new? 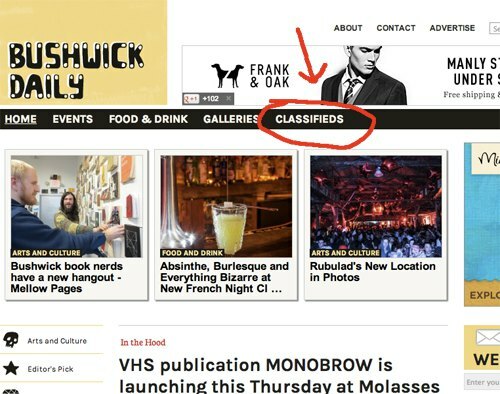 Bushwick Daily now has Classifieds! After the 5,000th request to help you find a roommate, job or a space for your next art show, it became really apparent that the Bushwick community needs us to create a Classifieds section. Since we love you, dear readers to death, we pulled up our sleeves over the weekend and created a beta version Classifieds! The response from the community was overwhelmingly positive, which makes us really happy. We tried to come up with categories that would really suit Bushwick, and so you can now post your ads for roommates, artist studios, jobs, missed connections and more! If you feel like we left out some important category or if you have any other feedback, please let us know in the comments section below. All the ads can be placed for free so you can go wild finding whatever and whoever you need! The only paid ads are apartment and studio rentals (sublets and roommate requests are still free), because that category will mostly be used by real estate agents and landlords for professional purposes. These paid ads cost $20 per month.